Never worry about your veggies falling through your cooking grids again with the Napoleon Stainless Steel Grilling Wok. Perfect for veggies, potatoes, and even seafood like shrimp, the vent holes allow airflow while the durable stainless steel conducts heat to perfectly grill your food. The built-in handles make tossing, mixing, and moving the wok a breeze, although we recommend using heat-proof gloves and tongs when handling. At 12-inch wide and 2-inch deep there's loads of room when cooking for a crowd. The Napoleon Stainless Steel Grilling Wok is dishwasher safe too, so cleanup is as easy as cooking. It's easy to make healthy choices when cooking with Napoleon's Stainless Steel Grilling Wok. Lodge Logic Cast Iron Square Grill Pan 10.5 Inch Seasoning is simply oil baked into the iron, giving you a natural, easy-release finish that will improve with each use. Dishwashers, metal scouring pads, and harsh detergents can harm the finish. If this happens, you can revive your seasoning. Be sure to lift your pan when moving it on a glass top stove. Use any utensils you like, even metal. Heat and cool your pan gradually for added longevity. No microware. 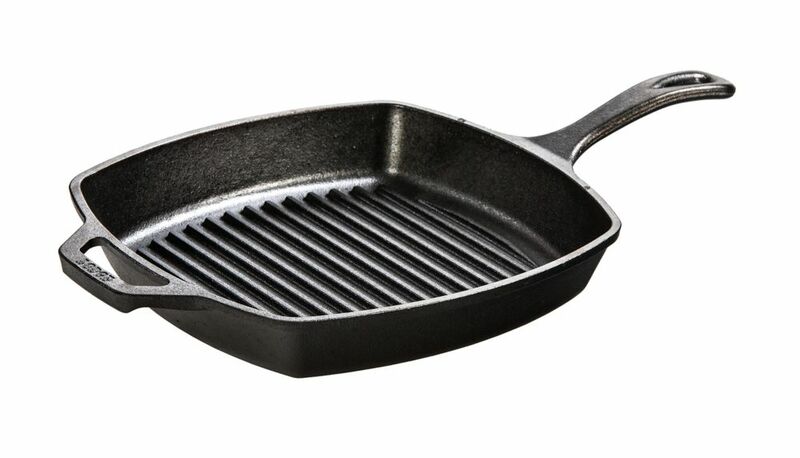 Lodge Logic Cast Iron Square Grill Pan 10.5 Inch is rated 4.8 out of 5 by 18. Rated 5 out of 5 by AnthonyB from Bought this as a replacement for an existing 10.5 inch... Bought this as a replacement for an existing 10.5 inch Square Cast Iron Grill. Will still use my existing one outside on my gas grill! The old one is not made in USA. I wanted to insure that my cast iron collection is USA made! Delivered as promised Ready to go! Rated 5 out of 5 by kay from This was a christmas gift for someone. He liked it. This was a christmas gift for someone. He liked it. Rated 5 out of 5 by Andrew from Cool! Once purchased, this pan can be used forever. No coating, just real metal. Love it. Rated 5 out of 5 by Dave from best quality Lodge quality for not much more. Really enjoy using this pan. Rated 5 out of 5 by Ken from Excellent product for home and camping. Excellent product for home and camping. Rated 5 out of 5 by Katrina from A healthier pan than chemical coatings A great sturdy pan that is healthier for you and doesn't require butter, sprays or heavy scrubbing. I love the raised grill design for searing and seperating the fat from the food. Rated 5 out of 5 by grillmaster from Lodge cast iron pans are my favorite, they are extremely well made, last a life time and easy ma... Lodge cast iron pans are my favorite, they are extremely well made, last a life time and easy maintenance keeps them looking good. The grill pan is perfect when you have only one steak to cook and don't want to light the grill.